The presents have been purchased and wrapped, the food shopping is done, mince pies are in the oven and I think I'm just about sorted for Christmas (we'll ignore the fact I still don't have a second Christmas sock...). So Happy Christmas! Thank you to all of you for dropping in and reading my blog this year; for every comment and email; for every pattern purchased and project completed; to everyone who has entered a competition or posted in my Ravelry group. I am really looking forward to 2018 and everything it has is store, and I hope you are too. Hope you manage to find a little time to rest, relax and, of course, knit over the festive period. This evening I will be casting on a new pair of socks for my Christmas Eve cast on, in Mind the Gap by Trailing Clouds. I've had this in my stash for ages and I think its time has finally come. Here we are, five days from Christmas, and you find me, somewhat predictably, busy. Most of the Christmas preparations are done: the tree is up, the presents have been purchased, the cards have been written, and everything that needs to be in the post has been posted; I probably ought to do a food shop and wrap the remaining presents, but otherwise I'm sorted. Which should allow plenty of time for relaxed knitting and reading, right?! Well, not quite. The schools here don't break up until Friday, so I'm still on full work mode, and am trying to finish writing some patterns this week so I have a decent chance of getting some sample knitting done over the holidays, as well as contemplating the year that's just been and anticipating the year to come: what's gone well, what hasn't, and where I want to be in a year's time. It can't just be me that gets terribly introspective at this time of year? Anyhow, I have resolved to make the most of it, and have bought a new notebook so that I can make a plan for 2018! This week's key crafting projects are very much labours of love: my husband's phone lives in a phone sock that I knitted for him ages ago. He has a new phone, and it requires a new phone sock. Easy. Just an evening or two's knitting, but it's the sort of obligation knitting that just isn't all that fun, so it feels slow even though it's not. I will definitely get it finished today, which is a good thing, then I can get on with something I want to knit! The second labour of love project is an odd one. My daughter has requested a cuddly toy bunny for Christmas. I have managed to purchase one that matches her requirements, but she has also requested that the bunny comes with some carrots, so I'm going to crochet a couple over the next few days, assuming I can find my crochet hooks, which have gone AWOL. Children sometimes ask for the strangest things; I might crochet a little basket to go with the carrots in the hope that we can keep the carrots belonging to the bunny separate from the other play food. I'm really looking forward to finding a bit more time to read over the Christmas holidays: I have acres of stocking stitch planned, so I can read at the same time. So far in December I have mostly been reading The Christmasaurus, which I finished last night and loved. This evening I will start reading The Girl Who Saved Christmas by Matt Haig, which was recommended to me by my sister, and next week I might finally get round to finishing Into the Water, which seems to have been on hiatus since the start of the month! I looked on my Kindle last week and realised I had downloaded a few books in the past couple of months that I've not looked at yet, so hopefully they might get some attention soon. As ever, linking up with Rachel for Yarning Along. What have you been reading this week? Today it is my great pleasure to introduce to you not one, but two new patterns: the Fantastical Fox hat and mitts. * Foxes have been one of my favourite animals ever since reading Fantastic Mr Fox as a child. My Fantastical Fox set is a homage to the humble fox. 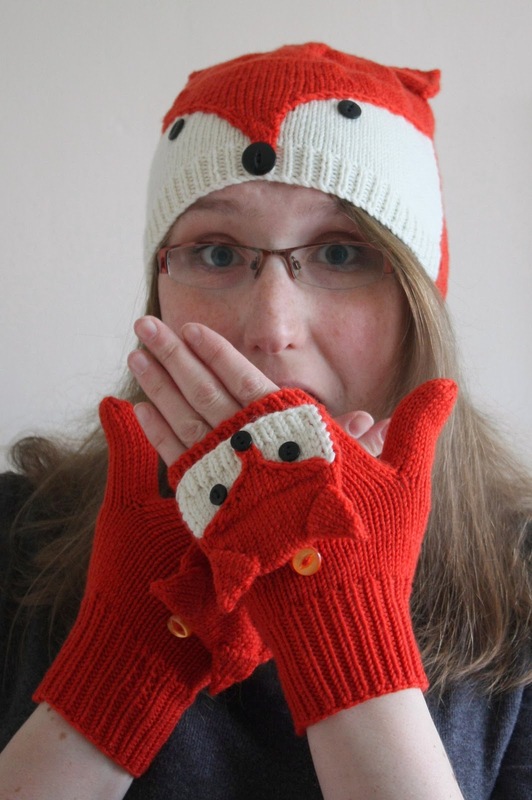 The mitts are fingerless with a flip top to keep your fingers warm whilst keeping them accessible for when you need them. 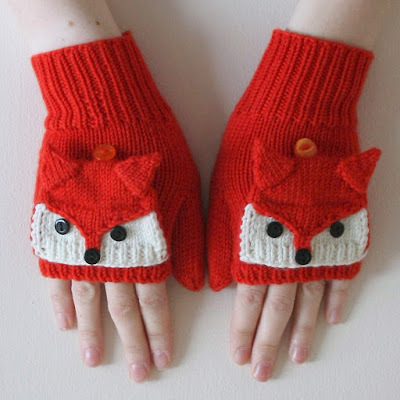 The pattern includes instructions for both short and full thumbs. The mitts are knitted in the round starting with the top flap, which is then joined in as the main mitt is knitted. A waste yarn thumb gusset is used, and the mitts themselves are completely seam free as they start with Judy’s magic cast on, which means you don’t have to go back at the end to join the top of the flap. The flap can be buttoned down using either a short crocheted chain or i-cord loop buttonhole; instructions are provided for both options. The eyes and noses are added at the end using buttons. 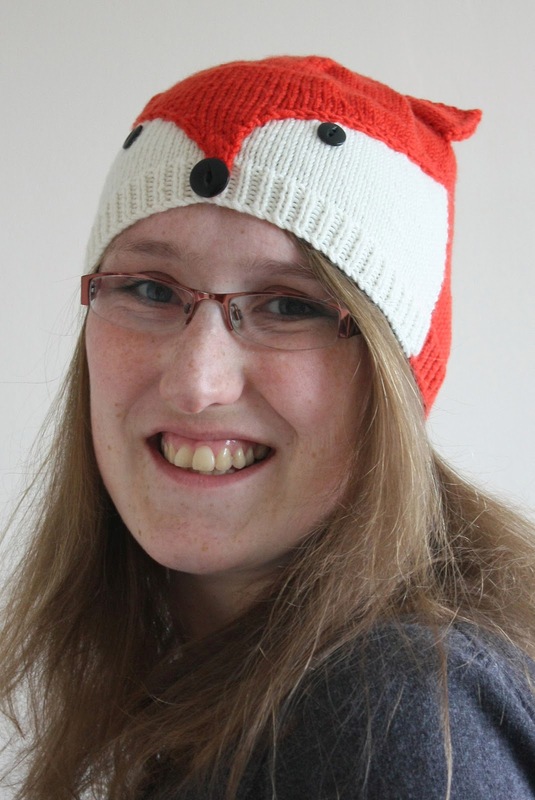 The hat is knitted in the round from the bottom up, with the fox’s face knitted using intarsia in the round, then the nose is added by picking up stitches and knitting a shaped piece that is stitched down. The ears are knitted separately, then stitched in place, and the eyes and nose tip are added using black buttons. From now until 11.59pm GMT Sunday 24th December 2017 you can get either of the patterns in the set (or the ebook, which includes both patterns, and is cheaper than buying the two patterns separately) with an introductory discount of 15%. No code is needed and the discount will be appiled automatically when the patterns are added to the basket. Both items are knitted in a DK-weight yarn at slightly tighter tension than usual to make the items hard wearing. The samples are knitted using Debbie Bliss Rialto DK** (DK weight, 105 m \[114 yds] per 50 g ball, 100% merino wool) in Burnt Orange (043, MC) and Ecru (002, CC), in size M.
The mitts are available in four sizes: S (M, L, XL) to fit palm width 8.5 cm [3.25 in], 9 cm [3.5 in], 9.5 cm [3.75 in], 10 cm [4 in], while the hat is available in three sizes: S (M, L): 45 (50, 55) cm [18 (20, 22) in], which should give you plenty of sizing options! I'd rate both these patterns as intermediate knits. Intarsia in the round isn't tricky, but can be a little be fiddly. Take it slowly and you'll be fine! As ever, I would love to see your finished knits, so why not add a project on Ravelry (hat; mitts)***, tag me on Instagram (@vikkibirddesigns), or send me a message (use the contact me link)? *The eagle-eyed amoung you may notice that these patterns were originaly published in Knit Now magazine issue 39, but they are now available as pdf downlaods from my Ravelry store. ***You'll need to be a member of Ravelry to do this. Membership is free. 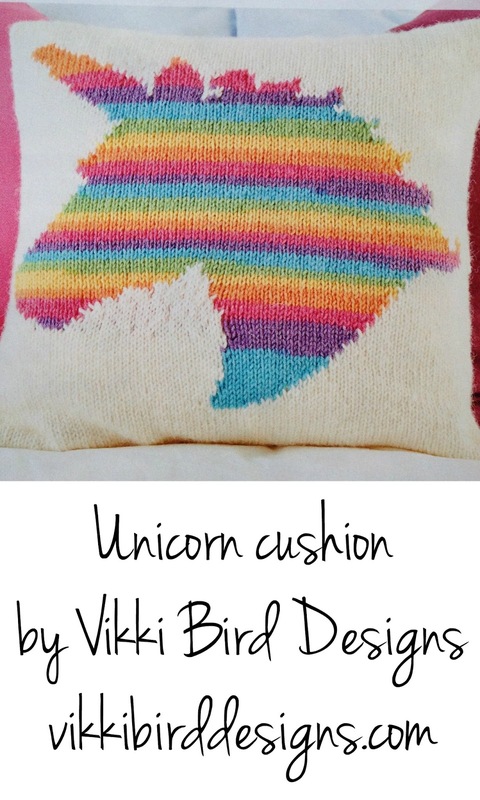 Unicorns have been everywhere for the past few years, and I have finally embraced the trend with my latest design, a unicorn cushion. The cushion features a rainbow striped unicorn head on a neutral background. The rainbow stripes are created using a single ball of self-striping yarn (West Yorkshire Spinners Aire Valley Aran*), which results in a striking effect for little effort. To maintain the stripes throughout the design, the yarn is stranded across the central blank areas. If you'd prefer a non-rainbow striped unicorn, simply chose one of the non-striping shades of the yarn. The cushion cover is knitted in one piece, seamed at the edges and fastened with 6 buttons. I had a little fun with the buttons and used rainbow shades to match the rainbow stripes! Want to knit your own? The design is included in the latest edition (issue 4) of Essential Knits, which is available now in newsagents and supermarkets, or you can order a copy online. It even made the cover! As ever, I would love to see your finished knits, so why not add a project on Ravelry**, tag me on Instagram (@vikkibirddesigns), or send me a message (use the contact me link)? *Sometimes called West Yorkshire Spinners Essential Aran. Affiliate link. You'll need three balls for the background colour and one for the unicorn. **You need to be a member of Ravelry to add a project. This weekend we started our Christmas activities with our visit to Santa. Both the kids were really excited, and it was lovely and festive. I'm not totally sure we're going to manage to keep the festive feeling carrying on for the whole of December, but I am aiming to spread our festive activities out over the month so we don't all get burnt out. This week I'm taking my daughter to the under-5s show at our local theatre, and I'm at least as excited about it as she is! And this weekend we're off to Newcastle to see Fenwick's Christmas window (a North East tradition). This year's window is Paddington-themed, so we're going to make a day of it and see the new Paddington film at the same time. We are now well into Advent, and this year I have an extra special advent calendar. A friend on Instagram organised an Advent swap, so I put together a parcel for someone and they put a parcel together for me. Every morning I get to open a tiny package containing 5 g of sock yarn and some little extras. I had originally planned to add the yarn to my sock yarn blanket, but had a last minute change of plan and cast on some scrappy socks. I am not totally ok with scrappy socks though, so have striped the yarn with a cream to minimise the risk of major clashes. I am up to Day 4 on one sock and Day 3 with the other, and have turned one heel, and so far have beautifully coordinated socks. I am now a little behind (mostly because of the extra knitting required for the heels) and am not keen on the yarns from Days 5 and 6 with what I have already knitted, so I'm not quite sure what I'm going to do next. I suspect I'll make a second pair of socks and everything else will end up in the sock yarn blanket. Do you have a yarn advent calendar? What are you doing with your yarn? 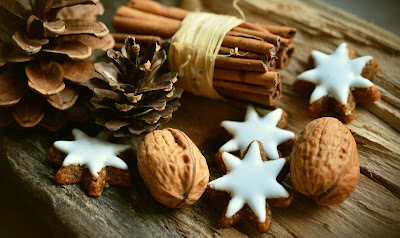 Last week I asked if anyone had any recommendations for Christmas books. Well, on Friday I went to Waterstones and browsed their festive reads table and came home with The Christmasaurus. Yes it's a children's book, but I am a third of the way through and am enjoying every second. So much so that my son and I are reading it together too. A definite Christmas book recommendation!